By some miracle this year a vast majority of Muslims in the UK managed to celebrate Eid-ul-Fitr on the same day (Sunday 20th September). Unfortunately this was not the case in Pakistan where people of the North West celebrated Eid a day ahead of rest of the Country. While the head of the Moon sighting establishment in Pakistan declared this illegal many like me wondered that how come in this day and age of science, when it appears all so easy to determine state of the moon, we still cannot agree on a single day for Eid. Anwar Ahmad, a good friend wrote the following article for Bazm-e-Iqbal to describe the issue in detail and offer possible solution. It is again one of those occasions when the entire Muslim community enthusiastically pursues their favourite game, “moon sighting”. Or is it "moon fighting"? Generally a reductionist approach is observed and the issue is conceived as inability of the orthodox Muslims to comprehend, trust and apply modern technology. The issue is more complex than choosing between actual sighting of the moon and relying on scientific calculations to mark the beginning of an Islamic month. So what is the issue, exactly? Before I comment on the existing approaches to determine the arrival of new month, let us briefly review the relevant Quranic verses and Hadith literature on the topic. A quick review of the Quranic verses that mention the moon does not provide any specific information as to what measure should the Muslims adopt to establish the beginning of new month. So, what does the second source of Islamic law, the authentic Hadith collection, tells us about it. Well, here we are fortunate to find some specific information which would subsequently become the basis for our judgement on the issue. It is reported on the authority of Hazrat Ayesha (ra) that the Prophet (saw) used to be more concerned about [determining the beginning of] Sha'aban than about other months. There is, however, an authentic Hadith which informs us that the Prophet (saw) fasted and ordered other people to fast on the testimony of one person, in this case Ibn-e-Umar. Having looked at the relevant Quranic verses and traditions of the Prophet (saw), we come directly to the most important question: is the “sighting of moon” a measure to establish the beginning of an Islamic month or a requirement? The answer will determine if we can use scientific calculations as a substitute measure to ascertain the beginning of a month. And this is precisely the point where opinion among the Muslims is divided. Both the proponents and opponents of actual sighting of the moon draw their conclusions on the basis of available Hadith and traditions. the description of this nation here as being illiterate is a praise to it in that it is independent of any complicated means in performing its basic worships. Anyone who rejects this would indeed overstep the consensus of the worthy Ulema [religious scholars], would be attempting to spoil the beauty and simplicity of this religion, and, worst of all, would be bluntly disobeying the Prophet (saw). There are some other traditions that are presented in support of the view that actual sighting is a requirement to establish the beginning of new moon. Before I move on to discuss the reasons offered by the group favouring scientific computations, I would like to highlight another issue. This is related to the “local sighting” of moon. 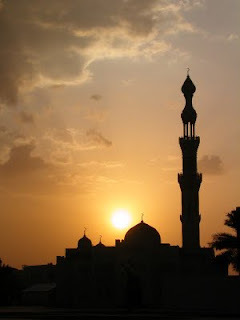 A tradition reported by Muslim relates a discussion between Abu Kuraib and Ibn-e-Abbas in which Ibn-e-Abbas did not accept Abu Kuraib's witness of sighting of the moon in a different town as the basis to begin Ramadan in Makkah. Let’s clarify this issue first. In the absence of any clear Quranic injunction and tradition of the Prophet (saw), it seems justified to deduct from the Hadith reported earlier that the entire Muslim Ummah [nation] has been addressed and not a people in a particular land. This issue is a remnant of a historical process. In the past it was difficult to send the news across countries and continents and hence local sighting was a necessity. All too often a tradition becomes sacred and thus remains in practice long after the requirements that necessitated it have disappeared. an unequivocal reference to “sighting” of the moon and witnesses required indicates that the new moon should be old enough for human beings to be able to see it in the sky. given that the Prophet (saw) did not like astronomical writing as a method to determine the visibility of new moon, are we not committing ourselves to abrogate an authentic Hadith reported by four important Hadith scholars? which phase of the moon shall we accept as the basis for beginning of a new Islamic month: geocentric conjunction or visibility? here another important principle of Islam, management of conflicting priorities, can be called in. If two virtues somehow collide with each other, Muslims would consider choosing the one which brings greater good and lesser harm. In this case the unity of the Ummah is at stake. The reputation of Islam as a rational faith is often questioned on this basis. On the basis of these arguments, it seems fair to adopt scientific calculations as a means to ascertain the beginning of new month. Also experience suggests that scientific calculations offer more accuracy than actual sighting of the moon. A large number of Ulema [religious scholars] now maintain and support this view. The answer to the second question has already been covered above. The emphasis on “sighting” and “witnesses” suggest that we can only accept “visibility stage” to establish the beginning of a new month. Geocentric conjunction of new moon does not mean that it will be visible [to human eye]. Technically, though, the new moon is ‘born’ but it cannot be sighted until it enters the visibility zone. It may take several hours before this happens. Whether we are able to sight the moon depends on weather conditions, pollution in the sky and location of the town among others factors. At this stage, however, sighting becomes somewhat less important because we know from reliable scientific calculations that moon would be visible if the sky is clear. This, however, is not a universally held view. Some countries, e.g. Turkey, consider the geocentric conjunction as the basis for beginning of a new month. throughout the Muslim world, beginning of a lunar month should be marked when visibility of moon is confirmed through scientific calculations or moon is witnessed anywhere in the world. This, however, does not mean that no further issues will arise. Certain situations - such as if visibility of moon is confirmed for North America in the evening, people in the Far East may not be able to begin the new month on the same date in the Gregorian calendar – will continue to bother the faithful. However, as long as a unanimous position based on logic and common sense is held by the Muslims throughout the world, that should not be a problem. The rigidity of the Gregorian calendar makes it incompatible with Islamic activities. We don’t need to be apologetic about it. It would not bother me if my brothers and sisters in Australia and USA celebrate Eid on different days but I would be as I was shell shocked when, a couple of years ago, I offered Eid greetings to a Muslim neighbour and found out, to my utter embarrassment, that he was fasting. JazakAllah khair for your sincere effort. However what you suggest has to be considered by scholars through the due process of Ijma with Ijtihad (of course without contradicting the Qur’an and Sunnah which are quite clear on the subject). Blogging on this subject to the common audience devoid of adequate knowledge would only create confusion and fitna (turmoil). Regarding the hadith that says “we are an illiterate nation”, the word used “Ummi” has multiple connotations in the Qur’an itself. The word ummi (unlettered or illiterate) comes from the same root as the word ummah (nation or common brotherhood). It refers to one who is not distinguished from the rest (by having ability to read or write). In other words ordinary or common or simple. Hence as Ibn Taymiyyah (Rahima-Allah-alaihee) has correctly alluded it should be understood as - we are a nation of simple methods devoid of complexity (where possible). Time and space are creations of Allah, in any case there is a gap of 12 hours, effectively half a day between time of people in opposite hemispheres, so you cannot wish Eid to a people across western longitudes, who might still be fasting while your country declares Eid at Sunset. It would help to check if it is Eid for people in another country while we phone call to wish.